The Blarney Stone is a block of bluestone built into the battlements of Blarney Castle, Blarney, about 5 miles (8 km) from Cork, Ireland. According to legend, kissing the stone endows the kisser with the gift of gab. The stone was set into a tower of the castle in 1446. The castle is a popular tourist site in Ireland, attracting visitors from all over the world to kiss the stone and tour the castle and its gardens. The word blarney has come to mean "clever, flattering, or coaxing talk". 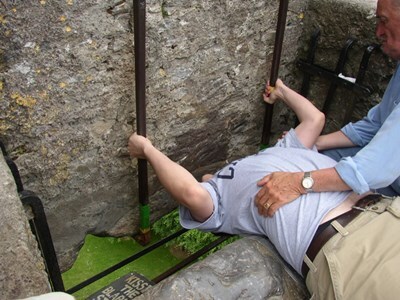 This description uses material from the Wikipedia article on Blarney Stone and is licensed under the Creative Commons Attribution-ShareAlike License (view authors). 146 people want to do this. 27 people have done this.